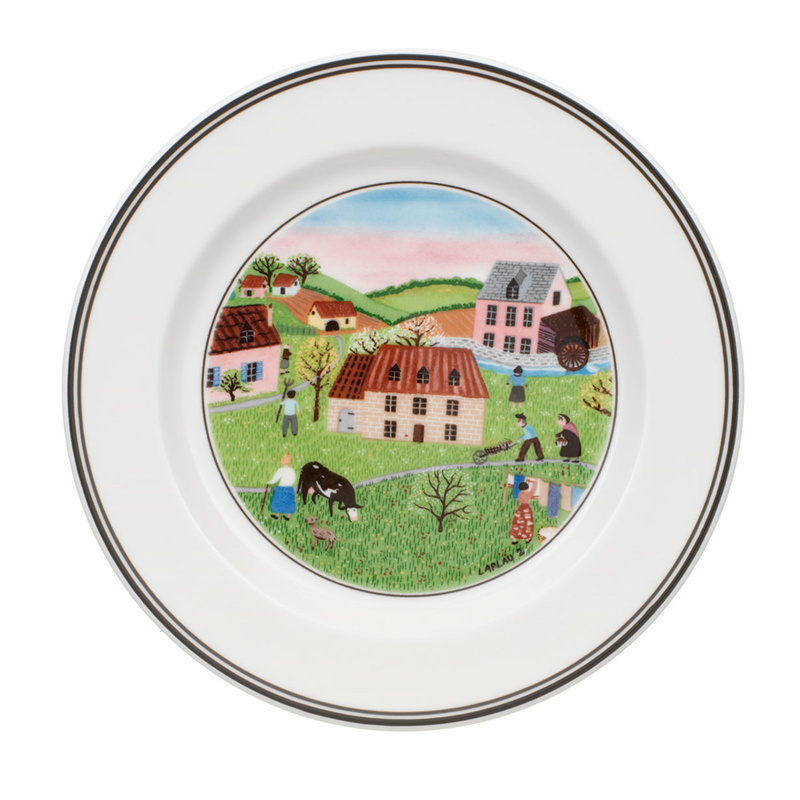 Fascination and charm: here is the Mill dinner plate Design Naif by Villeroy & Boch. 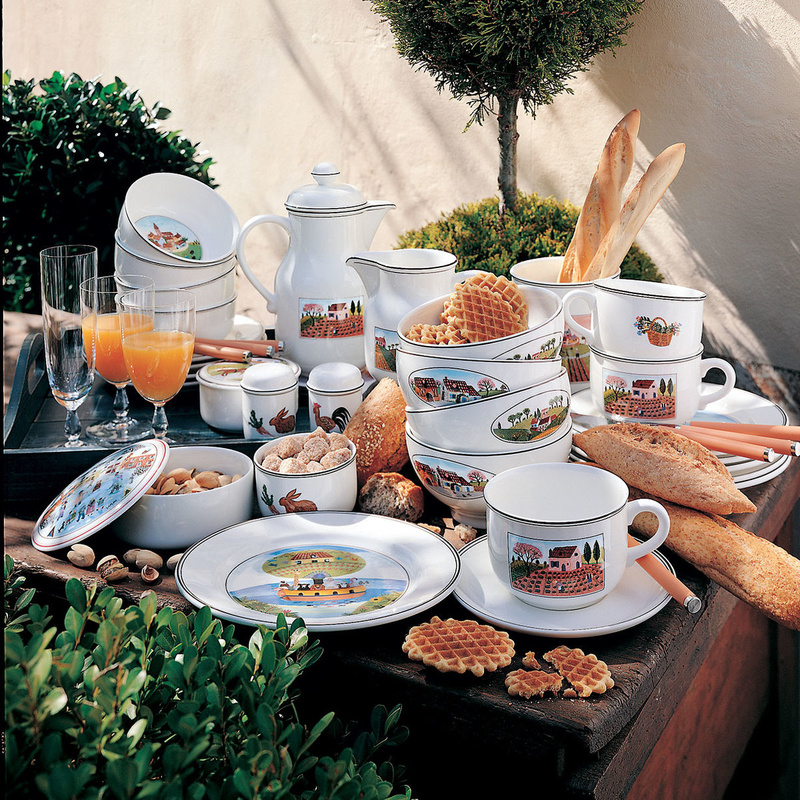 The Mill dinner plate Design Naif by Villeroy & Boch has become a real style icon to set the table. A plate with a unique character that combines charm and energy in one piece for the decoration of the table. An object in which you recognize the hand of the successful artist Gerard Laplau who designed it in 1979. The Mill dinner plate is part of the Design Naif collection and reflects the details of the whole line: valuable decorations related to the theme of the countryside that you can use to set up the whole table. This collection has played a key role in the affirmation at an international level of the Naif style as a real form of art. In particular, on the central part of this plate a rural landscape is represented, surrounded by hills, with some farms and farmers engaged in agricultural or domestic activities. The main colours of this decoration are pink and the light-blue of sky, and green of the hills. The drawing is enclosed surrounded by a black circle, and another one is designed on the edge of the plate. Always in black, you can read at the bottom of the painting the artist's signature. The Mill dinner plate is made of fine bone china and it was conceived as a set for breakfast or maybe for an afternoon snack. In is conceived to be both pleasant to the eyes and practical: you can put it in the dishwasher or in the microwave. The Mill dinner plate by Villeroy & Boch has a diameter of 17 cm and it weighs 230g. The Mill dinner plate and the entire Design Naif collection are real jewels, with an unmistakable class: you can match them with other items of the same line to set the table and surprise your guests. Villeroy & Boch has been working for in the field of ceramic products, and today it is present in over 125 countries in various continents. The company is well-known for its solutions for "Tableware" and "Bathroom and Wellness".